Home Ford Trucks Baby Blue 1956 Ford F600 – Still Working! It’s Working Monday again! We thought we’d show you this 1956 Ford F600 sent to us from Robert in California. It’s basically a stock 2 ton truck with less than 36,000 miles. Robert started a frame-off restoration 12 years ago. Show quality original color paint was applied again, one year ago. 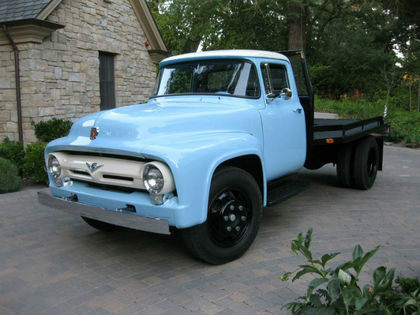 1956 Diamond Blue and Colonial White have given this Ford F600 the original look it deserves. This is a rare example of a stock, 2 ton version of the last year of Fords best looking F Series trucks. It has the original factory 272 Y-block V8 engine, which idles smooth at 600 rpm, and the original drive train with 4 speed transmission and 2 speed rear axle. The only non-stock item is electronic ignition. All tires are Road King Premium Highway. This is a solid running and driving show truck with no rust and top quality service and workmanship. Some of the rebuild parts on the truck are: new front kingpins, bearings and seals, and new rear bearings and seals. The brakes have been completely overhauled with new brake components including stainless steel brake lines. This F600 is fitted with both goose neck and bumper pull hitches. It’s ready to tow!